RepairDNS is a portable tool that can identify and remove DNS changer malware in your local network that can modify dynamic link resources to forward addresses to unknown third-parties. You can run the tool as soon as you download it since it is portable and no setup is needed. The log can be viewed directly in the main window and a status bar shows the progress of the scan task. 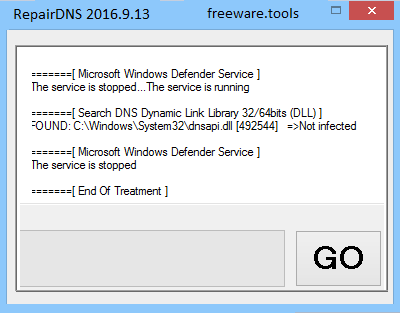 RepairDNS can automatically fix the infected dnsapp.dll file. The tool will find a healthy copy of the DLL file and use it to replace the infected version. Also, the application can generate a report as a TXT file so you can further analyze the infection. The sheer number of users accessing their bank accounts and similar pages on a daily basis is inevitably drawing the attention of multiple hackers that release malware designed to infect routers and hence, steal the credentials. RepairDNS is a lightweight piece of software designed to help you identify DNS changer malware that may be lurking in your local network and remove it securely from your system. The application does not require setup and thus, you can run it as soon as you download it to your computer. Upon launch, you are welcomed by a rugged and minimalistic interface, but that is also user-friendly and unlikely to give you any troubles. A large portion of the utility's interface is dedicated to the log that displays the results of the scan, so you can immediately learn if the file responsible for running the DNS is infected or not. At the same time, the tool includes a status bar in the lower section that allows you to preview the progress of the scan. It is important to note that the program is designed to fix the infected dnsapp.dll file automatically and does not require any intervention on your part. Generally speaking, infected dynamic link resources usually forwards addresses in the host file to malicious third-parties. The idea behind the application is to find a healthy copy of the DLL file and replace its infected counterpart. While you can preview the results within the interface, the program also creates a report in a plain text file that is commonly stored on the desktop. You can use the log to further analyze the infection and determine whether you are vulnerable to this type of malware. In the eventuality that you notice your Internet connection is slower than usually, you often get redirects to suspicious pages and other similar behaviors when you run your web browser. As a result, then perhaps you might be facing a DNS infection. RepairDNS is a tool designed to detect infected dnsapi.dll files and clean them accordingly.